Chopin's music has always posed a challenge to pianists. His music has retained a universal popularity and continues to be performed worldwide. Recordings of his piano music probably amount to thousands, so Chopin is apparently 'well-represented' – but important aspects governing the performances of his compositions have yet to be addressed. To gain insight into Chopin’s unique musical language and stylistic practices it is essential for the interpreter to comprehend as far as possible his expressed intentions. Our knowledge and appreciation of this most elusive and innovative of composers is greatly enriched by the combined study of not only his original manuscripts and related source material (i.e. draft scores, early editions and annotated scores), but also the many statements made by his associates, friends and pupils who knew his playing and teaching principles. In addition to the considerable amount of general correspondence, reviews and reports of his concerts are revealing, although not always laudatory - especially from avid supporters of the 'sledge-hammer school' (Chopin’s description of pianists applying excessive force to the piano). It is also necessary to familiarise ourselves with Polish folk-music and the historical development of the Polonaise, Rondo, Krakowiak, Oberek and Mazur. Most of us concert pianists lead very busy lives so it is reasonable to ask whether or not it is really necessary to undertake the time-consuming task of such studies. To answer that question, one so often addressed to me, I would like to cite a single example of the wide disparities that exist between Chopin's performance directions and the interpretative approach many pianists commonly adopt when playing his famous 'Black Keys' Study in Gb major, Op.10 No.5. We are familiar with performances of this remarkable Study executed in brilliant bravura style - Allegro con brio/Presto with highly-charged forte dynamics, heavily accented and liberally pedalled - to suit the desired virtuosic display. This approach is, however, in direct opposition to Chopin's original score markings and his concept of its interpretation. His score markings were actually given as leggierissimo e legatissimo (extremely light and delicate with a very smooth effect), carefully balanced against an unpedalled staccato l.h. accompaniment. The exaggerated dynamics and 'express train' tempo markings imposed on this Study are not to be found in the original manuscripts and so we have, regrettably, arrived at an opposing concept to that of the composer! To achieve the delicate lightness of touch required by Chopin is far more demanding technically, especially on the large concert grand pianos of today. A tonal refinement easier to ignore than achieve! There is also the problem of maintaining the tempo to include the double-octaves that descend in a final flourish of triplets. No slowing down of pace is indicated here, but it becomes inevitable when the overall tempo is taken too fast. Double-octaves being more difficult to play technically at a faster tempo than single notes! Presto metronome markings applied to this Study in editions are not from Chopin. Where score markings are correctly stated in editions his compositions still unfortunately fall prey to all manner of facilitating alterations in performance, perpetuated by generations of pianistic 'tradition' and trends. Regrettably the variety of erroneous 'revisions' imposed on Chopin's scores from those who arrogantly seek to remould his music into versions that suit their purposes better are often praised. The facilitating options of 'personalised interpretation' with 'flexibility of expression'- to the extent that originally written score directions are all but eclipsed - are too often defended. A carte blanche or 'free for all' when interpreting Chopin is often actively encouraged on the misguided premise that pretentious sentimentality and histrionic (mis)interpretations actually 'improve' his compositions. To perceive Chopin as the archetypal Romantic languishing in a violet-scented mist of indecision about his scores is a misconception borne of spurious legend. Chopin had very definite views on strict adherence to his score details: "Chopin could not bear anyone to interfere with the text of his works. The slightest modification was a gross error for which he would not pardon even his closest friends, not even his fervent admirer Liszt. The composer considered these alterations as a veritable act of sacrilege". (Reported by Marmontel) [Chopin: 'Pianist and Teacher' by Jean-Jacques Eigeldinger] Chopin occasionally pencilled an altered dynamic or variant into the scores of pupils during lessons but it was only his prerogative as the composer-pianist to make any such alterations. 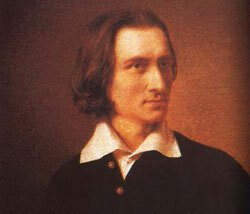 On the subject of the sentimentalise/Romantic approach, we know that he shunned all forms of excess or exaggeration and was never a Romantic composer in the Lisztian or Byronic sense. 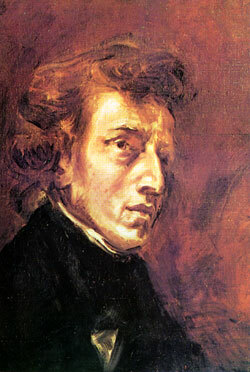 Chopin’s unique musical language and aesthetic belongs to earlier forms of art-music and Classicism. He revered the music of Bach and Mozart above all other composers - the significance of which should not be underestimated when playing Chopin. It is vital from an artistic and aesthetic standpoint that interpreters allow absolute priority to score directions and remain within the 'guidelines' marked on the texts by the composer. These provide our most fundamental link with his intentions. To clarify these 'guidelines', albeit simplistically, I refer to score indications/performance directions that form the basis of all interpretations: e.g. that sotto voce and pianissimo/piano markings are not substituted for a 'preferred' mezzo piano/mezzo forte/forte, or broad largo/lento tempos exchanged for the faster pace of an Allegretto etc.. Chopin was also strict about the observance of his precise phrase/slur markings and agogic signs, whilst pedalling 'remains a study for life', as he said, and requires constant consideration. “He plays legato and piano with the pedals and not with his hands!”, was one of Chopin’s many censures. 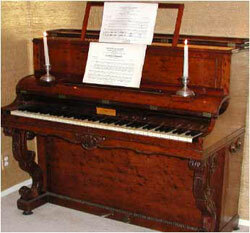 Chopin's preferred piano was the 'silvery thin-toned' French Pleyel. Having played two of Chopin's Pleyel pianos, it is evident that the sustaining pedal could be held through harmonic changes without sacrificing the clarity of the notes. Where he indicates extended pedal markings to create a veiled and magical effect, we have to apply some caution on the resonant full-toned concert grand pianos of today if we are to avoid creating an amorphous mass of sound. Within the wide variety of musical terminology and signs that form our score instructions the expressive scope is comprehensive. It is evident from his manuscripts at least that Chopin left nothing to doubt for his copyists and editors, crossing out his rejected score details with thick webs of diagonal lines that render it impossible to decipher previously written details. In the words of Arthur Hedley, “He hesitated long before attaching a final indication of tempo or expression, so that no pianist has the right to treat these things as a simple matter of personal preference”. To further avoid misunderstanding Chopin would write a message on his score for the engraver to clarify his precise intentions. All of which proved no guarantee against errors from copyists and editors. An example can be found in the first C major Study from Op.10 where original ms copies show only two bars to be played forte - but most editions indicate forte throughout with accents added to the r.h. figurations. 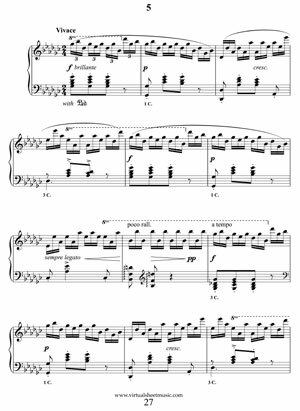 Chopin also wrote diminuendos for the re-entry of the main 'theme' and at the closing measures. These diminuendos are often shown in editions, but are replaced with crescendos instead by most interpreters. The technical difficulties of playing the widely extended r.h. arpeggios in this Study are certainly facilitated if played relentlessly forte with unwritten sforzando bass octaves on a concert grand piano. But the question arises - is it what Chopin would have wanted? For those who consider that the composer knew best how his music should be performed, the answer is clear. A composers’ manuscript is not merely a piece of graph paper on which we can plot our own design. There exists the ever-present predilection to sacrifice the ultimate realisation of Chopin's art to personal whim. Wayward performances displaying an obvious ambivalence towards the text are often claimed as 'great' or even 'definitive interpretations' either for commercial purposes or from obvious misunderstandings of his music. 'Virtuosic' displays of meaningless digital dexterity and the flashiness of excessively fast tempos, hard-hitting aggressively exaggerated dynamics and uncontrolled tempo deviations that debase and trivialise his music have become the facile recipes for many accepted Chopin interpretations. This is not only seriously misleading to the public and untruthful but commits a grave disservice to the composer. The true art of Chopin playing presents a challenge that needs to be thoroughly reviewed and reassessed. "Simplicity is everything.. After having played immense quantities of notes, and more notes, then simplicity emerges with all its charm, like Art's final seal. It is no easy matter." Chopin. - (From a statement made by Chopin to his pupil Friedrike Streicher-Muller, who studied with the composer from October 1839 to March 1841 and was the dedicatee of his Allegro de Concert, Op.46). Great music should surely ennoble the spirit, create a moving experience and provide a lasting impression to reflect upon after the final notes have been played. To allow the composer to be revealed through the re-creation of his music must be the ultimate aim of an interpreter.